We listened to the customers on this one. 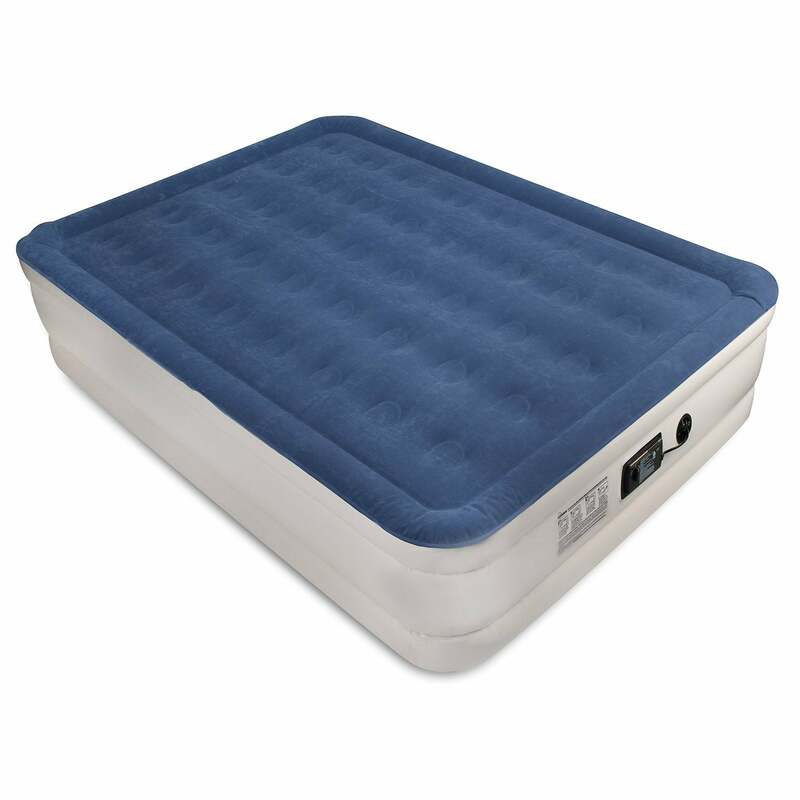 Over 14k air mattress reviews and an overall 4.5-star rating. Two people can sleep comfortably here. It’s a tall bed, so you won’t feel like you’re sleeping on the floor. Unlike most we’ve tested, this one was actually easy to fold and fit back into the bag. The product description says it takes four minutes to inflate and deflate, but it felt slower to us. Adjustable firmness settings and a neverFlat air mattress pump system for consistent comfort. Comfortable, customizable, and consistent thanks to the neverFlat system that silently inflates the mattress throughout the night. It’s sometimes too firm for customers’ liking. It’s heavy (23 pounds) and hard to fold and carry. The height is a plus for folks who have difficulty getting up or down from low surfaces, but it seems susceptible to sagging after a while. 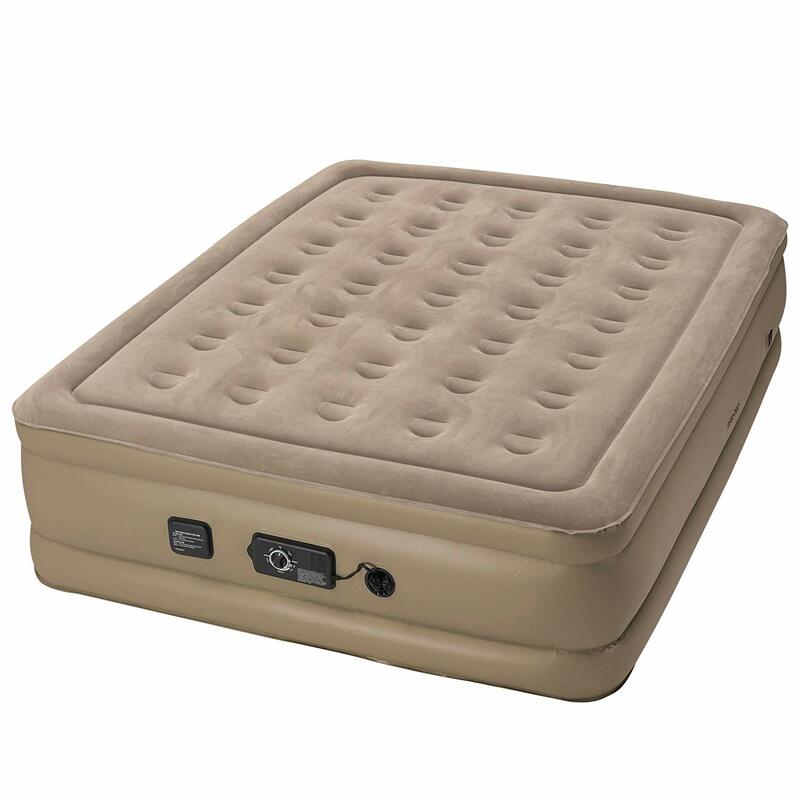 This twin air mattress is perfect size for squeezing an extra bed into a tight, narrow space. It inflates quickly to a helpful height for adults. 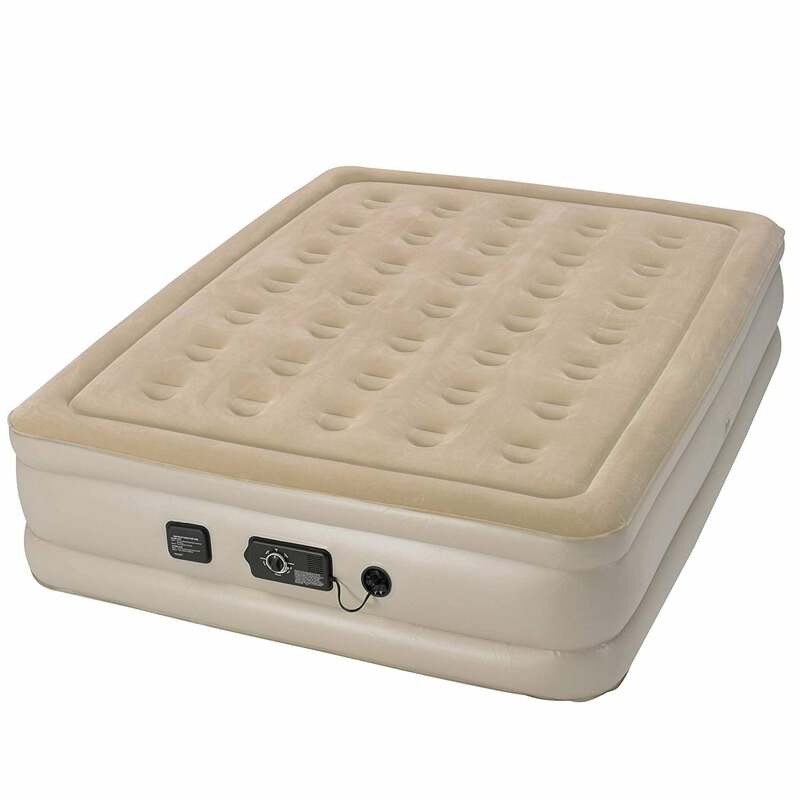 Probably not the longest lasting air bed but it is covered under a 1-year warranty. Reasonably priced, but the “stretch system” may be better for guests who are staying a while. This is a fast-inflating air mattress with a built-in pump. The indented sides makes quick work of fitted sheets. We loved the look of its dark color scheme too. It’s is designed to stretch as you sleep, which could require you to inflate it more often. The manufacturer says it should settle after 2-3 uses. Another neverFLAT option that’s speedy to inflate and deflate, but a bit more expensive. The Serta air mattress has an auto shutoff feature on its primary pump and that secondary neverFLAT pump. It’s also covered under a great warranty that’s uncommon in the air mattress market. This queen air mattress doesn’t feel true to size. One customer dubbed it a “fueen”. Whether you’re moving into a new home, hosting overnight guests, or traveling, you’ll be looking for temporary sleeping accommodations sooner or later. Enter the air mattress. We’ve all used them at one point or another and it’s certainly a love-hate relationship. That hopeful beginning of a good night’s sleep can quickly deflate with a poor mattress that winds you up on a hardwood floor for the rest of the night. To make sure your next purchase is convenient, comfortable, and reliable, the House Method team tested air mattresses in our lab and our own homes. Air mattresses are inflatable mattresses made of vinyl, plastic, or rubber, that you can inflate with a simple pump. They’re typically inexpensive and convenient purchases to accommodate you or your guests when temporary sleeping accommodations are needed. Air beds give sleepers a chance to stretch out and get a decent night’s sleep when the likely alternative might be the sofa or the floor. Because they’re often smaller than beds and they inflate and deflate in a matter of minutes, you won’t need much time or space. They’re also easy to fold and often come with a storage bag to stow away when they’re not in use. You’ll dress these air mattresses as you would any other bed with sheets, bedding, and pillows. Some even have an inflatable headboard. Fancy. There are a range of air mattresses to choose from. Size, one to two pumps (built-in or separate), adjustability, and longevity are all factors to consider before you buy an air bed. Buying a blow-up mattress shouldn’t be complicated, but if being a hospitable host is important to you, you might find yourself weighing your options. To make your decision easier, we compared the best air mattresses above and compiled our research into a buying guide below. Adjustable firmness. Fill with less air for a softer surface. Fill with more air for a firmer feel. The SoundAsleep Dream Series air mattress offers consistent comfort. It has 40 supportive air coils and a non-slip grip, which is helpful on hardwood floors. It inflates to double the height of standard air mattresses for those who have trouble rolling in and out of short beds. Blow-up mattresses may be comfortable, but they’re definitely not always dependable. This product has minimal leak issues and great customer service if you need it. Some air mattresses are inflated with a separate pump that’s either corded or battery-operated—usually D batteries. Today, many have built-in pumps. The cord is connected directly to these mattresses. Some air mattresses with built-in pumps have a neverFlat system, which quietly and continuously inflates the mattress throughout the night to keep it at a consistent inflation level. Just keep in mind the potential noise and extra electricity involved with continuous use. Inflatable mattresses are available in all sizes from twin to king-size air mattresses. With bloated sides, inflatable beds may not be totally true to size. This could be frustrating when trying to outfit yours with a fitted sheet. Don’t overlook height before making your purchase. Low mattresses are convenient for especially tight spaces and are easy to move and store. But they can be hard to get in and out of, and potentially less comfortable. For an added layer of comfort and improved mobility for older folks or those with back or joint pain, opt for a mattress that sits higher—18 inches or so. Some air mattresses have settings (plush, medium, or firm) that allow you to easily adjust the comfort of your mattress. Others have a coil system that should add support, which could absorb a restless partner’s movements throughout the night. And an inflatable headboard may seem ridiculous, but it’ll keep your pillows in place. You could also add a mattress topper for an extra a layer of “ahh”, but this will also add weight and make your mattress more prone to midnight deflation. Price is based on size, comfort features, and pump design. Large mattresses with more adjustability, such as neverFlat technology or comfort coils, may cost between $100 and $120. For those looking for smaller, simpler options, you can snag a basic $50 mattress that will keep you off the floor for at least a couple of nights. Leakage can occur with or without punctures in mattresses and it’s extremely frustrating in any scenario, but it’s likely to happen—even if you buy the best air mattress. 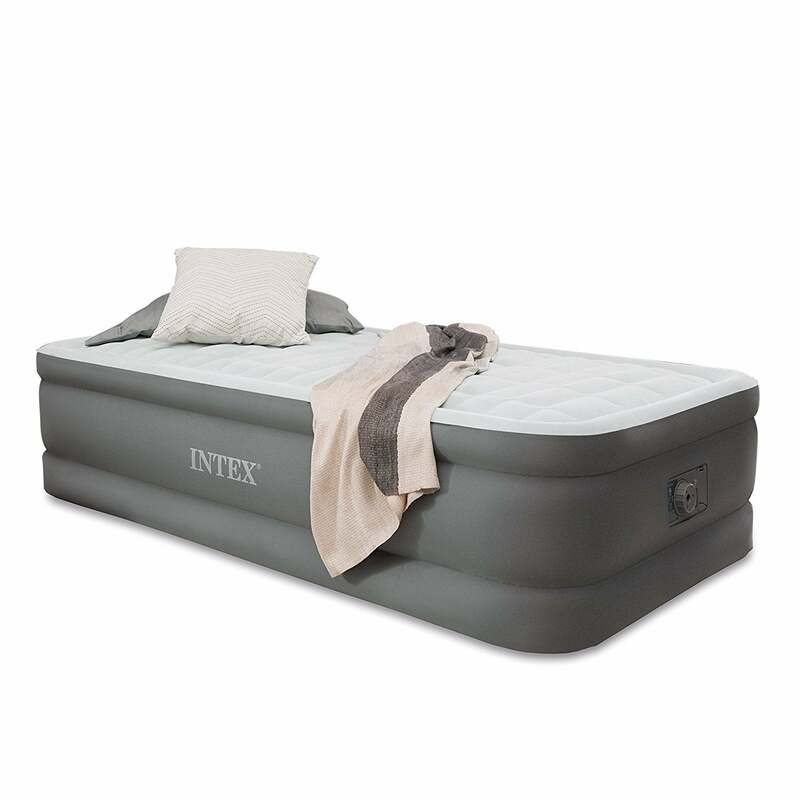 When comparing inflatable beds, we gave weight to the air mattress reviews that mentioned durability. Responsive customer service and warranties were also important to our team. There are DIY solutions for patching holes too. If and when you find yourself in this situation, consider a bike tire repair kit or even hot glue to repair a hole. “Relax, it’s not leaking,” the manufacturer addressed customer’s comments about sagging and deflation. 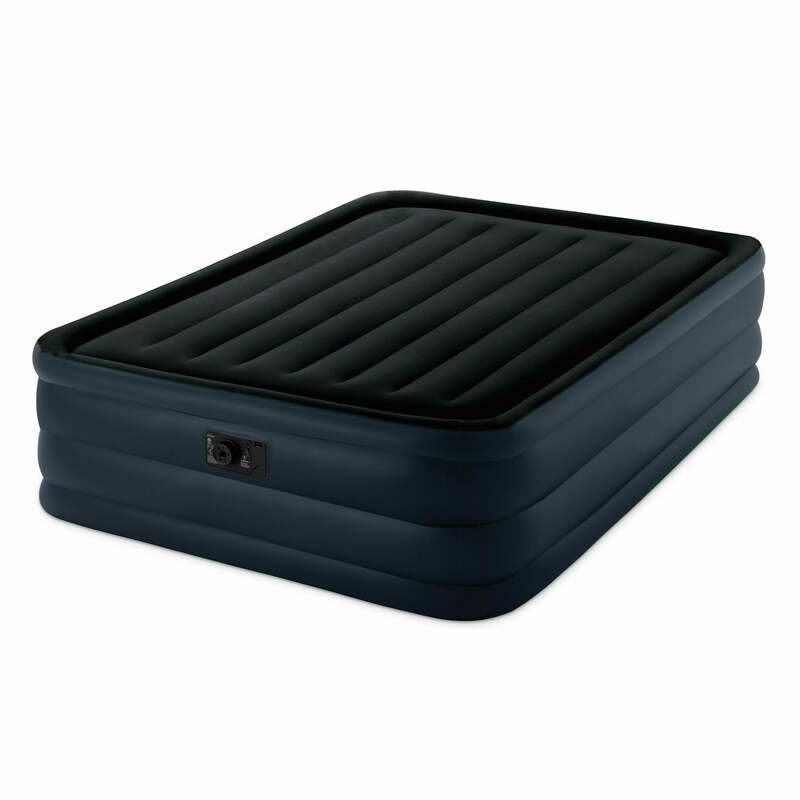 The material of this air bed stretches with the first two to three uses. This, the manufacturer says, may be misinterpreted as leaking. After breaking this air bed in, your guests should sleep soundly on the otherwise comfortable Intex Raised Downy mattress. The extra height gives it an added layer of support and makes it easier to get in and out of bed. It’s also exceptionally quick to inflate despite the added volume. It’s the cheapest option we reviewed, but it’s not covered under warranty. Locating a leak is harder than it sounds. Fill the mattress and check hole-prone areas, like the bottom or seams, and listen for air. No luck? Wet the surface with a soapy sponge and apply pressure to the mattress. Bubbles will give it away. 2. After finding the leak, clean the area. A patch won’t stick to a dirty surface. A dab of hot glue. Although, direct application of a hot glue gun could burn a bigger hole. 4. Cover the material with super glue and apply to the hole. 5. Clean the area after repair the hole. 6. Then, test your work by listening again for air or trying the soapy sponge trick. Although you can’t be too terribly picky when you’re dealing with a blow-up mattress, the Insta-Bed is the most adjustable air mattress we reviewed. Its neverFlat technology ensures consistent airflow during the night. You won’t wake up in the middle of the mattress sagging dangerously close to the hardwood floor beneath you. It’s also a great choice for couples. More weight makes it more likely to deflate—unless you have the support of a neverFlat system. This inflatable mattress also has customizable settings in case the neverFlat system makes it too firm for your comfort preferences. What are the best air mattresses for everyday use? The SoundAsleep Dream Series air mattress is the best one we reviewed. Thanks to its 40-coil support system, it’s comfortable and the most reliable mattress we tested. If you’re looking for a tried and true mattress, you can rest assured. This one has more than 14,000 reviews and a 4.5-star rating. Customers also love the Insta-Bed and Serta air mattresses for the neverFlat technology that minimizes leakage and maximize your chance at a good night’s sleep. What is the best air mattress for camping? You’ll want an air mattress with a separate, battery-operated pump if you’re taking it into the great outdoors. It’ll have to the leaves and debris beneath it, so look for mattresses made of thick materials with a waterproof flocked top. Unless your tent is truly huge, you’ll likely have to settle for a twin air mattress. A smaller mattress will also be more portable. While air mattresses can be comfortable enough for some customers to use them for weeks, months or even years, they’re not recommended if you have pre-existing back or joint problems. They can’t provide the support you might need while you sleep to ensure proper alignment. Long-term use can risk some back pain and stiffness in certain customers. Yes, they can be very comfortable. Look for an adjustable, extra tall air mattress (18 inches or more) to make sure your chosen product is one with proven comfort. Customers usually add a pillow top for another layer of comfort for themselves or guests. Why does my air mattress keep losing air? Air mattresses most often lose air because of leaks from holes. You can fix a hole in by first, locating the trouble spot. Check especially hole-prone areas, like the bottom or seams. From there, clean the problem area. Then, repair the hole with the patch kit that probably came with your purchase. If you don’t have a patch kit, a bike tire patch kit, shower liner, or pool patch works well too. How big is a full-size air mattress? Air mattresses are similar in size to traditional mattresses. For more compact space, try a twin air mattress, which is usually 38-by-74 inches. Full-size air mattresses are about 54-by-74 inches. Width and length keep increasing as you move to queen, king, and California king options, but height is important too. If you suffer from body aches, look for one that’s 18 inches tall.